* The Pioneer DDJ-SX is an advanced performance DJ controller designed specifically for the Serato DJ Software. 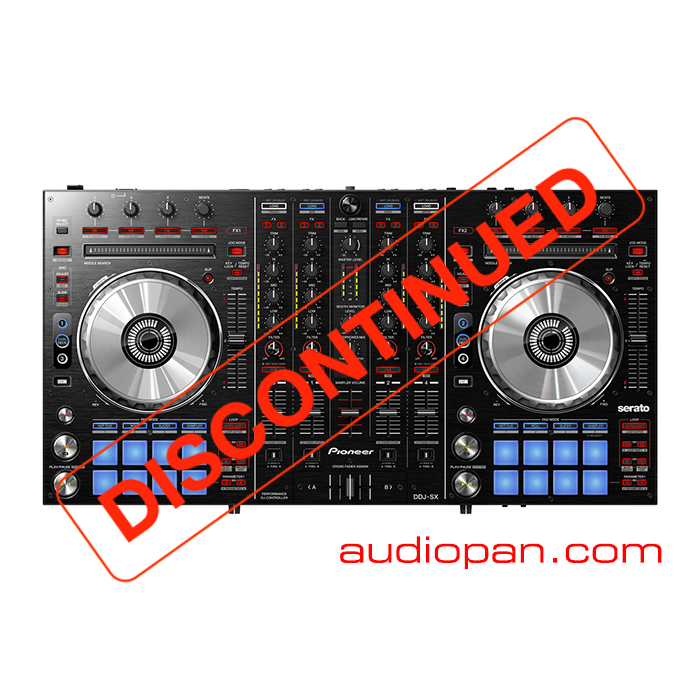 * Pioneer DDJ-SX Serato based DJ controller utilizes the software as the basis for its configuration and ergonomic design, taking advantage of its features and integrating special trigger pads and controls. * Pioneer also implemented larger jog wheels for precise mixing and scratching, multiple inputs for expandability, and 4-channel mixing flexibility. Sold as a complete system that includes the controller and new Serato DJ software, the DDJ-SX provides additional features to provide direct, tactile control of the software’s capabilities, which include a four deck sampler function, dual deck control, slip mode, FX mode and more. Dual Deck – The DDJ-SX enables two tracks to be controlled at the same time, allowing scratching or setting and recalling hot cues on both tracks as if they were performed on a single track. FX Powered by iZotope – High quality FX newly developed by iZotope. With the new effects, DJ can apply more creative and more unique arrangement to the music. Performance Pads – Pioneer added eight “performance pads” located below the jog wheel for four different functionalities – HOT CUE, ROLL, SLICER and SAMPLER. Each soft-touch rubber pad illuminates in blue to enable users to quickly tap the pad(s) for each effect, with the output volume varying depending on the strength of each tap. Large Jog Wheels – The jog wheels on the DDJ-SX are enlarged for more precise scratching and mixing. The resistance for each jog wheel was fined tuned to provide users with the best “feel” and the shortest latency. The unit also features an “On Jog” display located on the center of each wheel to provide instantaneous visual feedback of playback status and the position of playing tracks. 4-Channel Mixer – The DDJ-SX features an independent 4-channel mixer that can be used with other external sources such as turntables. Its master level meter provides instantaneous sound level adjustment as well as independent output controls with a display indicator for each channel when used as a standalone mixer. Aluminum Finish – The DDJ-SX sports an aluminum top panel and a brushed aluminum finish for the jog wheels for optimal look and feel. Serato DJ Software – The new Serato software is bundled with the DDJ-SX for an easy out-of-the-box experience. Multiple Connection Options – The DDJ-SX offers dual CD and phono/line inputs for external devices as well as two microphone inputs, two master outputs (XLR and RCA) and a booth out terminal. High Quality Audio – A low-jitter clock and high-performance digital-to-analog converter (DAC) are used for accurate audio playback. Adjustable Cross-fader Curve to suit any type of mixing style. Channel Fader Start – Enables the use of the channel fader to control and play/cue tracks.